If your house has more than one floor, chances are good that there is a lot of wasted space above and below your stairs that is just crying out to be filled with stuff. 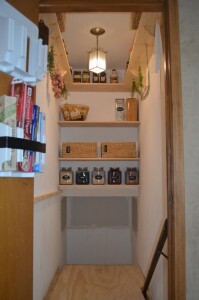 Shelves underneath the stairs are easy, and something that I added when we first moved in. 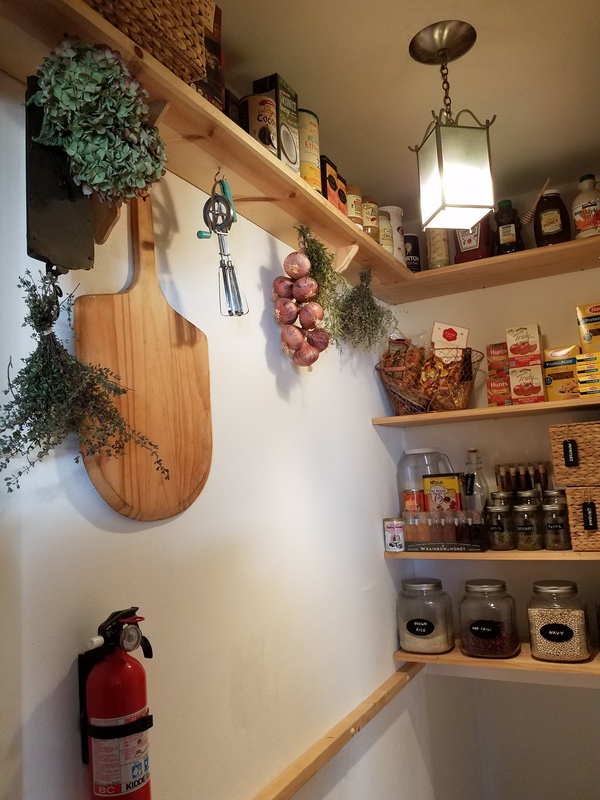 But after years of climbing up and down the steps and staring at all of that empty white space up there, I finally had to do something with it, so as a side project to my current family room remodel, I’ve conjured up an entirely new room right off the kitchen that I’m calling a butler’s pantry. The floor is a piece of 3/4″ plywood made just a bit beefier with some 1x4s, connected with some heavy duty hinges to a 2×4 attached to the wall with lag screws into the studs. 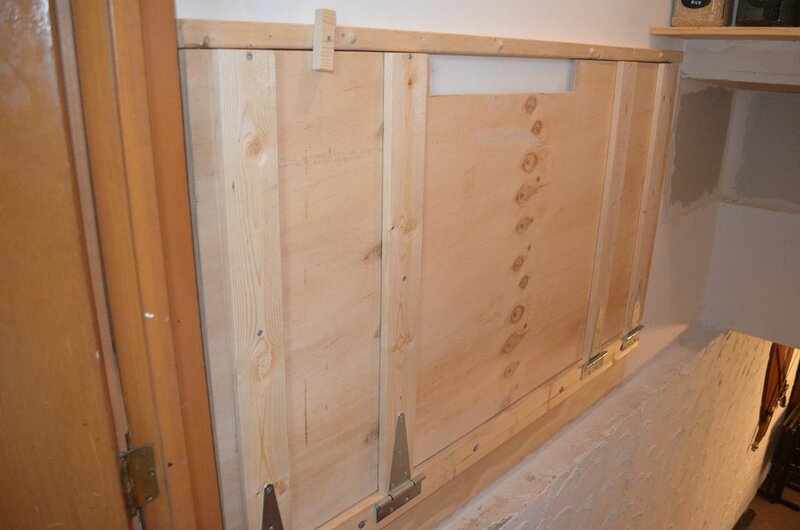 It rests on a matching 2×4 on the opposite wall, and I cut a notch out of the wood to allow room for the handrail. This was designed to hold a single person, but we’ve already tested it with two adults (300+ pounds) and it had no trouble holding us. 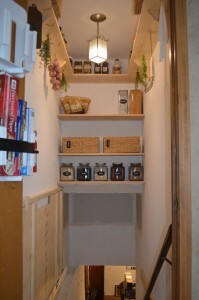 Once the floor is in place, you can assemble whatever kind of shelves or hanging storage containers you like. I used 3/4″ pine boards that will easily hold 50-100 pounds on each shelf. 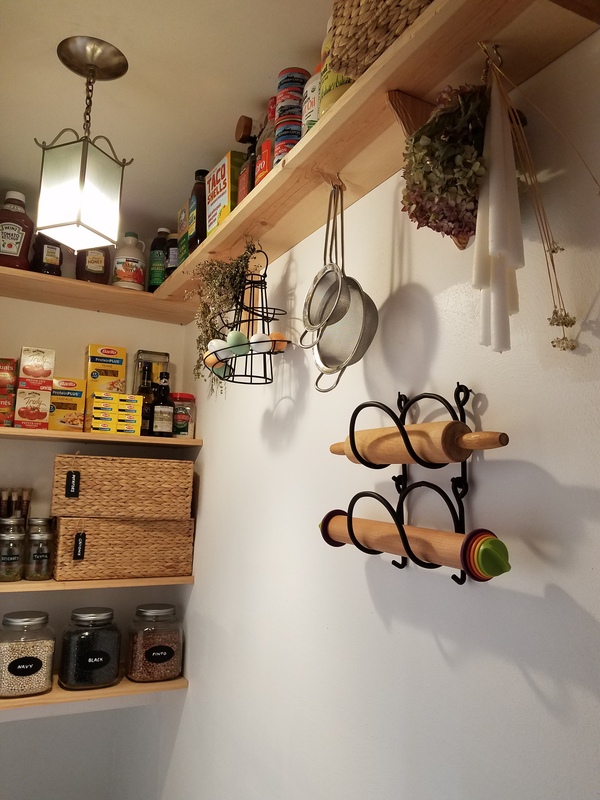 Add a few hooks to the underside of the shelves and you have a place to hang pots and pans, or dry herbs from your herb garden. Mmmm… smell the rosemary. 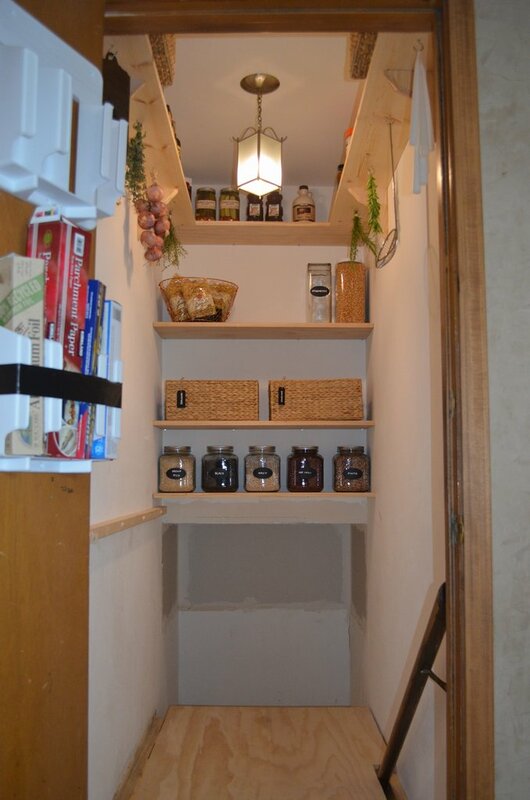 For just a couple hundred bucks in lumber and hardware, maybe you should add a new pantry to your house too? Eat your heart out Pinterest! 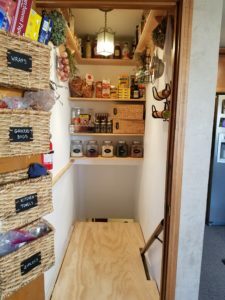 [Update: 3/11/18] I added a couple of recent shots to show the current state of the pantry. Very nice Jerry, impressive use of space. I have the same empty space and have been looking on line, trying to figure out how to use it. This is perfect! My house is 480 sq. ft. and need all the storage I can get. Nice job! Exactly what I would like to do to my stairway!!! Perfect place for a pantry to hold dry goods, canned goods, pots pans !!! 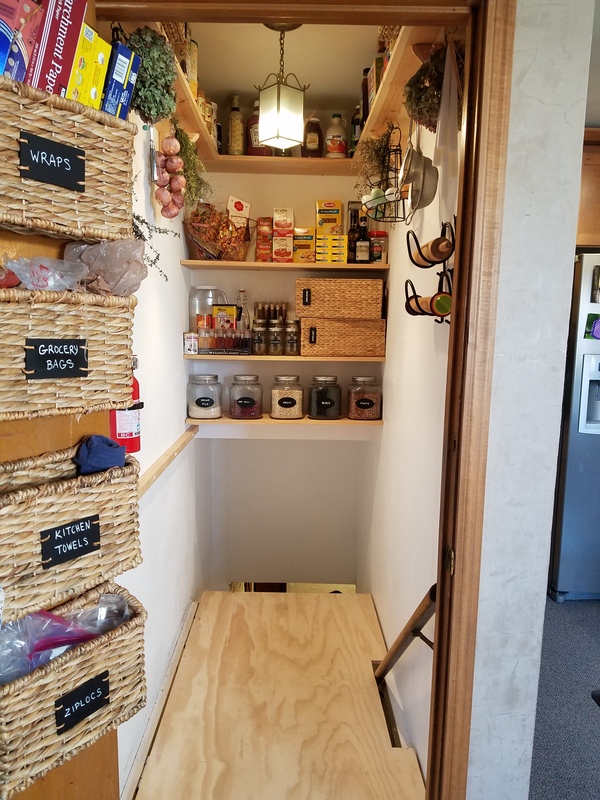 Free up kitchen cabinet space! How does the door get up and down ? And how much does it weigh ? Pam, we lift it manually and it probably only weighs 15-20 pounds – it’s not a full sheet of plywood. 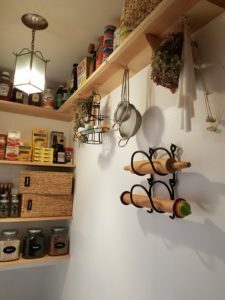 What did you use to hang the shelves? The shelves on the back wall are just sitting on screws that I put into the studs on all three sides. The hatch door over our steps was perfect until we tried to put the hinges on. The door wouldn’t open and we would have to shorten the door, try it again and still no good? Any rules of thumb when binging it? There’s an old carpenter’s saying – measure twice, cut once. 🙂 The part that required some trial and error for me was notching the board around the handrail. How wide is your stair case? Wall to wall width. It’s about 38″ wide. Why? 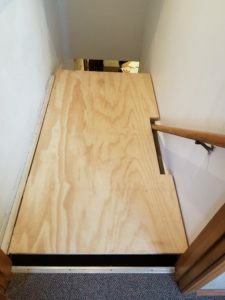 You can make it any size you need by cutting the plywood the right size. It took me a couple of times dry-fitting it to get it right, especially the notch around the handrail. This is brilliant! Hope I can get my husband to agree that this is exactly what we should do! Very cool idea, and it turned out so nice! One thing that would I would add is a sheet of vinyl or lightweight laminate flooring over the plywood to help keep it clean and make it look even more finished. How much weight do you think that floor could handle? I want my husband to do this because I feel like we could fall down the stairs when walking in w/our crazy dog . My plan would be to have it down all the time unless we needed to go in the basement do you feel that could work? 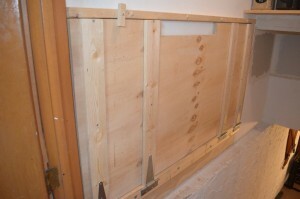 If you use 3/4″ plywood, like I did, it will hold a lot of weight. We’ve had about 350 pounds on ours (two adults), but I bet it could hold a lot more. Do you or could you please take a pic of the plywood in the up position? Would like to see how it looks when not in use. There is a photo on this page already. How do you pull the floor up? I don’t see any handles or a strap or rope. Do you hook something into the hole that cut out to clear the railing? This is awesome I just did this in my stairwell as well. Nicely done!!!!! This is such a wonderful idea. Will you come to my house and build it for me? A couple of years use! You are so neat and tidy. Excellent result.